Shanghai Blues is housed in an imaginative conversion of the former St Giles library in Holborn. Beautifully updated this fashionable and sophisticated dining room has high ceilings from which large lanterns hang with pretty silk awnings and subtle lighting; it’s luxurious yet simple. The quaint blue granite entrance bar serves as the ideal spot for innovative cocktails and pre- post dinner drinks. Shanghai blues has been awarded its first star in the Egon Ronay Guide 2006 and has received favourable reviews from Harpers & Queen, Time Out and The Daily Telegraph. Staff are welcoming with a polished, professional and cheery attitude. The tables are spacious, the portions generous, the experience lovely. There is 'Live Lounge' every weekend. Guests can relax and unwind with a variety of jazz bands, highly respected on the London and European music scene. The main bar serves Shanghai Blues signature cocktails using well-known recipes with a twist to give them an Asian theme. Everyday between 3-5:00pm you can extend your chae knowledge with an intriguing selection of Chinese teas and dim sum for a unique afternoon experience. Mixing business with pleasure is encouraged at Shanghai Blues. Exclusive hire is available and the restaurant can accommodate 200 guests seated. There is VIP mezzanine area, and 2 other private dinning rooms. Whatever the occasion be it a private party, business meeting, corporate entertainment or product launch, these flexible private rooms are available with menus tailored to suit individual requirements. PA and sound system are also available. Remarkable head chef Hong Qiu Feng acclaimed within Chinese government circles combines a sophisticated delicacy of flavour with elegant presentation. 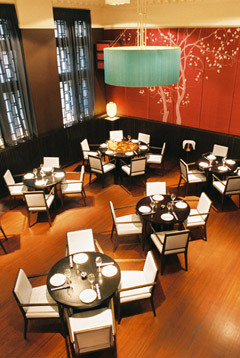 The menu focuses on a modern regional cuisine from Shanghai with an impressive array of Dim Sum. Be sure to try the chef's Signature dishes and there's an all day dim sum menu. Desert is entirely based on traditional Chinese recipe�s perfect for all those after a complete Chinese experience.